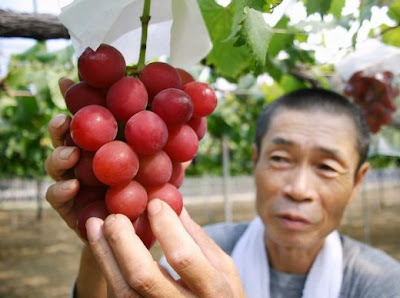 A new variety of premium grapes debuted in Japan on Monday, with a single bunch fetching as much as 100,000 yen ($910). A Japanese hotel manager paid that amount, or about 2,860 yen ($26) per grape, for a 1 1/2 pound (700-gram) bunch of the Ruby Roman grapes to serve guests at an upscale hotel, officials said. heck out 2 more pics after the jump. 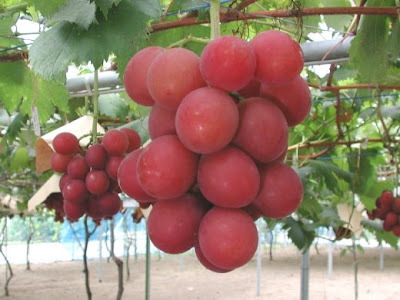 The tomato-colored grapes made their debut at an auction in Japan’s northwestern Ishikawa prefecture, where they have been under development since 1994 in a state-led project. The bunch that fetched the top price had about 35 grapes, each slightly smaller than a pingpong ball, Isu said. 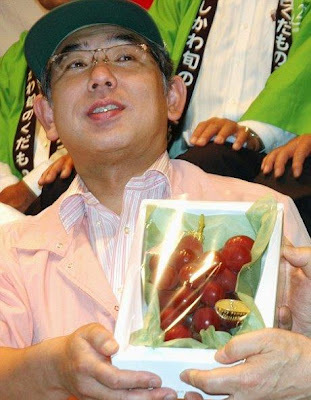 The average price for the Ruby Roman grapes at Monday’s auction was about 27,000 yen ($245) a bunch. Isu said local farmers hope to sell 1,500 bunches, or 1 ton, of the grapes by mid-September.